Top Chef Recipe: Pork Carnitas in an Oatmeal Tortilla. Bravo's Top Chef latest challenge was a healthy hot school lunch contest. I was delighted to see a pork carnitas recipe from contestant Kelly Liken take the win. This dish looks pretty tasty not to mention healthy with a tortilla made out of oatmeal. You can find the Top Chef recipe Pork Carnitas with Pickled Onions and Oatmeal Tortilla here and a link to a video below. Three year old Zane recently declared my homemade granola, "Better than M&Ms". I couldn't be happier about Zane's new favorite snack. Granola chock full of dried fruit and nuts and baked with olive oil and honey is pretty tasty stuff not to mention healthy. Zane likes to snack on his granola dry. I prefer mine with non-fat plain yogurt, fresh fruit and drizzled with honey. Below is my simple granola recipe. Enjoy. Combine all wet ingredients in a small in a bowl, stir to mix. Combine wet ingredients into bowl of dry ingredients. Mix with hands or wooden spoon. Spread granola mixture evenly onto a large metal baking sheet with sides. Bake at 350º for 18-22 minutes or until golden brown. Remove from oven and allow to cool completely. Transfer to an air tight container for storage. NOTES: Granola is a very forgiving recipe and experimenting with dried nuts and fruits is recommended as is oil. I've been using extra virgin olive oil for the richer flavor and the way it complements tarter dried fruit such as cherries. Canola and vegetable oils are the traditional oils used in granola and worth experimenting with as well. I've also experimented with agave as a substitute for honey. Sure these spanakopita triangles were designed as the classic 80's cocktail party finger food but why let adults steal all the fun? These tasty little spinach & feta treats are fun to make with your kids and their little triangle shapes pack well for lunch. Kids love the crisp buttery crunch of the phyllo dough so much that they forget they are eating spinach & feta. I used this recipe from epicurious but added a sauteed leek to the spinach feta mixture for flavor and texture. Since I was packing these spanakopita for lunch I baked mine extra crispy and used a minimal amount of butter so that they were not oily. I made a quick dipping sauce of yogurt, chopped dill, lemon and honey. I think my son would have rather I left the dill out, maybe just honey & lemon for the kids. So when your kids are 'hungry like the wolf' let them party on at the playground with the classic spinach triangle. When Life Deals You Black Bananas. Make Banana Bread. Yumm. Who doesn't love a tasty moist slice of banana bread?! Banana bread is a quick yummy homemade treat for the kids lunch box and a wonderful way to recycle those over-ripe black bananas that I always seem to have in my fruit basket. I've made this recipe many times and it's pretty forgiving if you're up to making it with your kids. Always moist and always a hit. Using electric mixer, cream butter & sugar well. Add the eggs and beat well. In a seperate bowl combine all of the dry ingredients and then combine with the butter mixture and blend well. Add the bananas, yogurt and vanilla stir well. Stir in the chopped nuts and pour into loaf pan. Bake for 1 hour, until a cake tester comes out clean. Wait until cooled to slice. Help! Everyone around me is sick. Including my two year old who has a cold and has lost his appetite. I challenge that lost appetite to a berry smoothie! Smoothies are a great way to get food into a kid that needs to eat but isn't eating. High in nutrients, cool on the throat, easy on the stomach and disguised as a sweet treat - smoothies are the perfect meal for a sick kid. Whipping up a smoothie in the blender is easy. For me, the hardest part is hoisting the blender off the top shelf in my kitchen. To make the pictured blueberry smoothie I combined equal parts: Frozen organic blueberries, organic vanilla yogurt and 1/2 a banana. Of course it's a smoothie so you can add whatever combination of fruit or fruit juice plus yogurt that you like. For the stomach flu, aka the runs, our pediatrician recommends a smoothie made of rice milk, banana and a spoonful of peanut butter. Sounds pretty tasty to me. Kids Love Pumpkin Pie... Ravioli! Halloween may be over but pumpkins are still in season... in ravioli that is! If you're a local San Franciscan, swing by Lucca Ravioli Company on Valencia street for a box of delicious house made pumpkin ravioli. Lucca has been making ravioli at their Valencia street location for over 80 years plus they have their own parking lot which is an added bonus for busy Moms. For my friends and family in Philadelphia, Di Bruno Bros. near Rittenhouse Square carries pumpkin ravioli. Pumpkin ravioli sounds exotic but don't be fooled, it's a great dish for kids! It's easy to prepare, they love it and it's chock full of vitamins A, C and K.
I told my sons they were eating pumpkin pie pasta for dinner and they gobbled it up. Pumpkin ravioli is extremely easy to prepare - toss cooked ravioli with a simple butter sauce. I suggest a melted browned butter with sage leaves that have been cooked to a crisp in the hot butter with salt to taste. Word on the streets of San Francisco is that Mayor Gavin Newsom eats a turkey wrap every day for lunch. He also listens to country music on his iPod. I say, "blech" to the country music selection but let's try out a turkey wrap for The Green Lunch Bag recipe file. Wraps are a great alternative to sandwiches and hand held food is always a hit with the kids. The thin flour tortilla instead of bread makes wraps a lighter lunch with fewer carbs than a sandwich. When shopping for tortillas look for thin flour or wheat tortillas with zero lard, these will be healthier and easier to roll up. I found tortilla wraps at Safeway and Whole Foods. Safeway had the plain flour ones and Whole Foods the organic wheat ones, both by the ''La Tortilla Factory". A funny side note: The organic wheat tortillas are not labeled tortillas but "Artisan Wraps' and the word sonoma is emblazoned on the packaged as well as a commitment to sustainable practices. The key to a successful wrap is in the cheese. You will need to spread a thin layer of whipped cream cheese to adhere your lunch meat to the wrap or surprise - the wrap can all fall apart. Mayonnaise is too slippery, tortillas are not as porous as bread so adding mayo would just be like a flume ride for your lunch meat. Go with the cream cheese and remember, don't overload your wrap with ingredients or it won't stay closed. Corn on the cob in 6 minutes! Yes! You too can have corn for lunch. Yum Yum Yummmy! 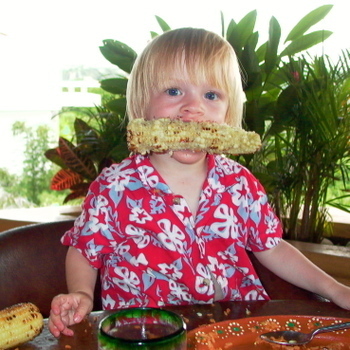 Kids & pigs just love sweet corn on the cob - it's the perfect messy eat with your entire face yummy finger food. Boiling corn for lunch is a major hassle but thanks to the speedy microwave you can have tasty juicy corn for lunch in 6 minutes. Lunch Note: Corn on the cob packs well for lunch, kids love to eat it cold. Chop the cooked cob into smaller sections to pack easily into a container for lunch.